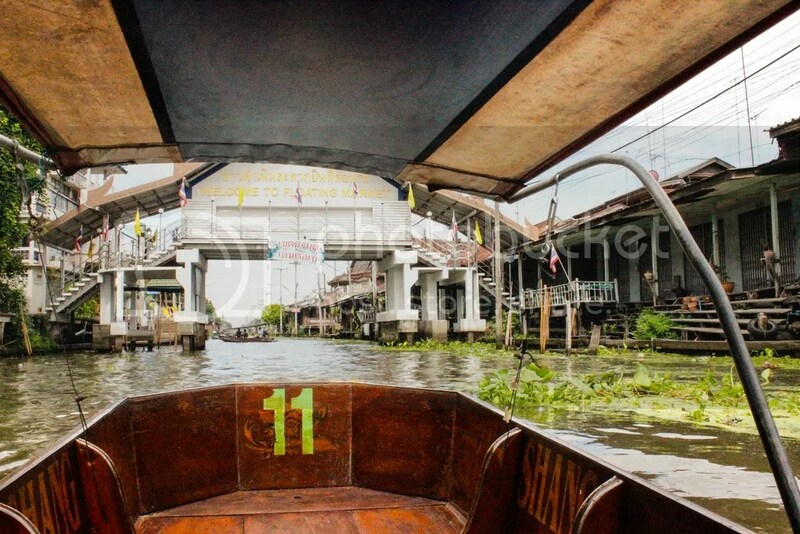 The Amphawa District has so much to see – the Floating Market, the Mae Klong train track market, the Temple in the Banyan Tree, benjarong handpainted ceramics, and the King Rama II Museum. And an important note on Thai massage. 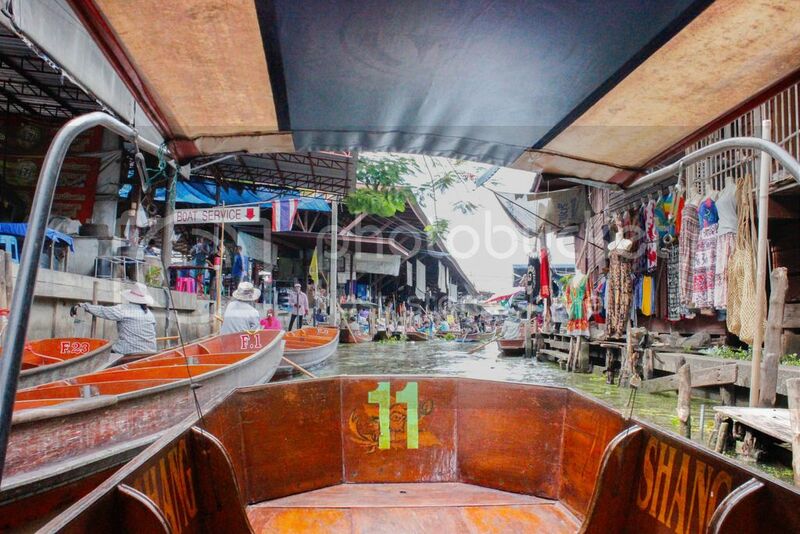 Day 3 in Thailand brought us to the Amphawa district, about an hour and a half outside of Bangkok. We were supposed to take the train, but unfortunately the tracks are being worked on for about 6 months (I think our guide said it would be up and running again in December). 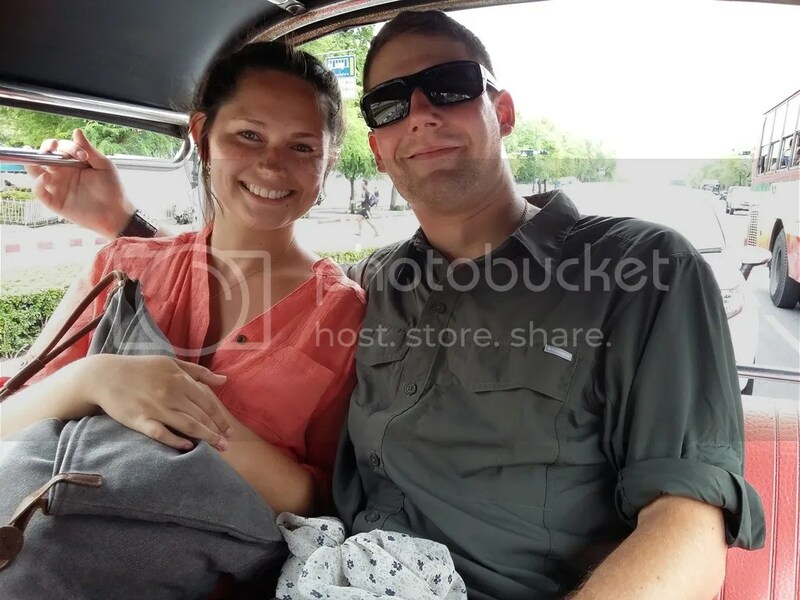 Instead we took a van and got to make a stop along the way to see a working salt farm. 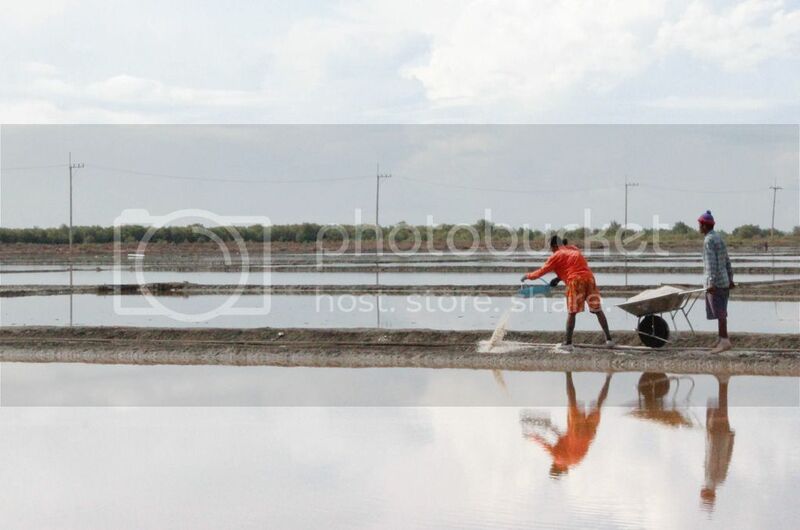 Because it was the rainy season, most of the salt farms were out of commission. 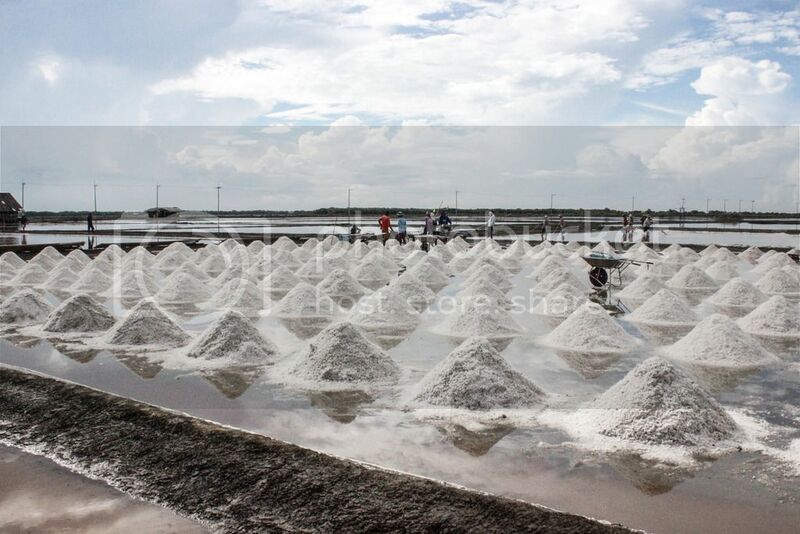 The rain dilutes the high concentrations of salt and makes it nearly impossible to dry into crystals. 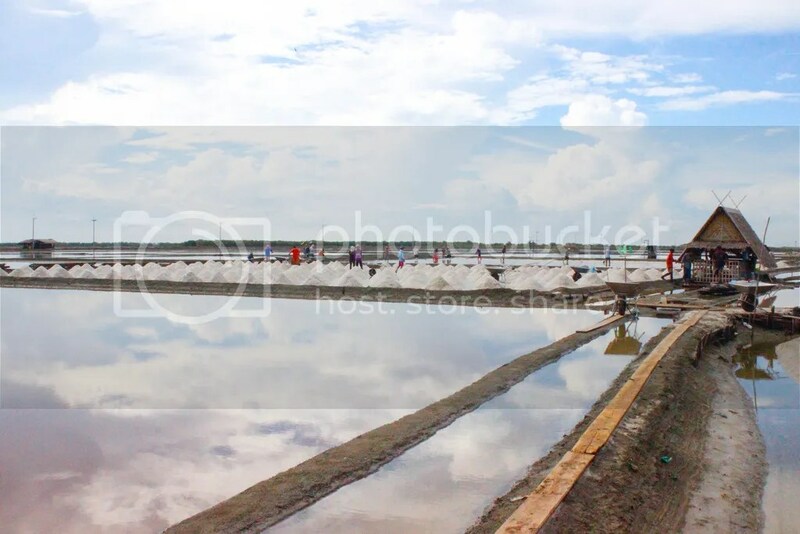 But luckily for us, one lone salt farm was making use of the sunny day. 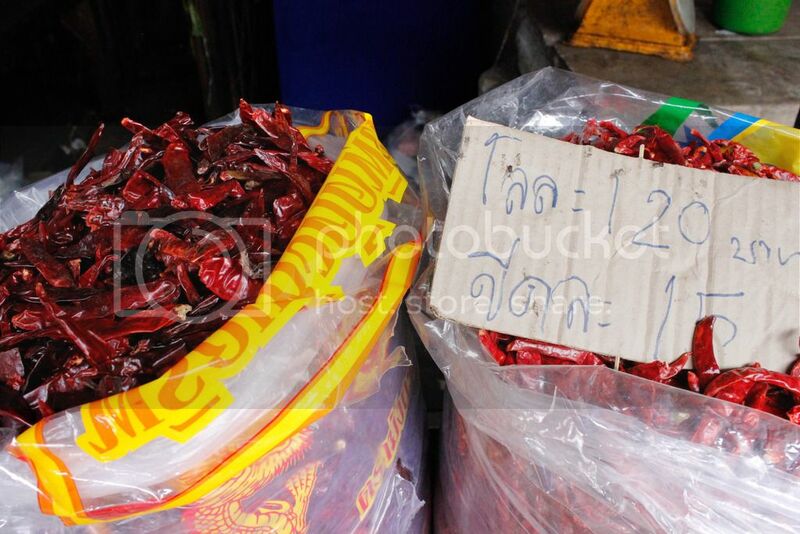 Our guide told us that the workers earn ฿2 per kilo, so they want to work as much as possible. Sea water is brought inland and allowed to evaporate until the salt concentration reaches a certain percentage. 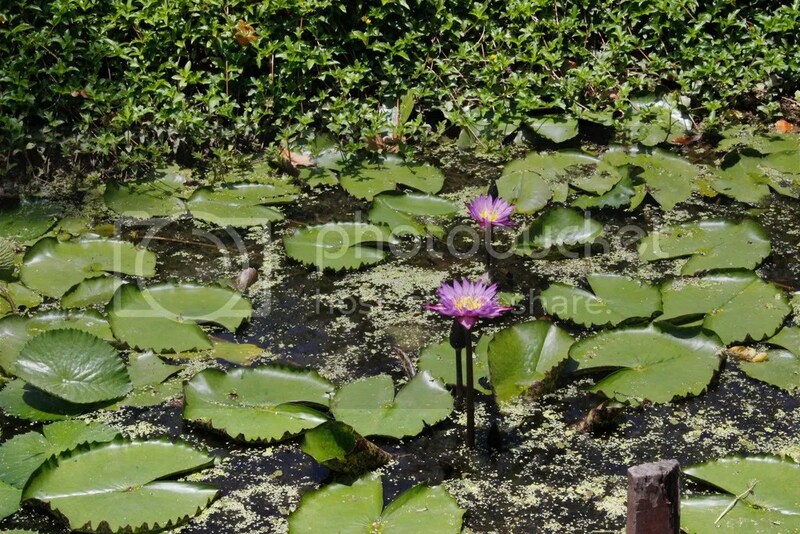 Then it’s transferred to shallow dirt basins to dry out even more until it forms a layer of salt just below the surface of the water. 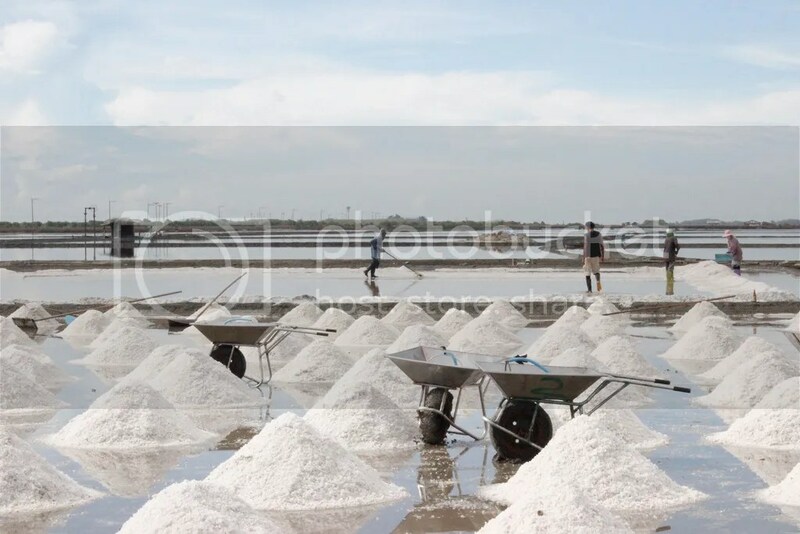 We watched men take long-handled scrapers and run them up and down these huge basins, breaking up the salt layer and pushing it into small white mounds. 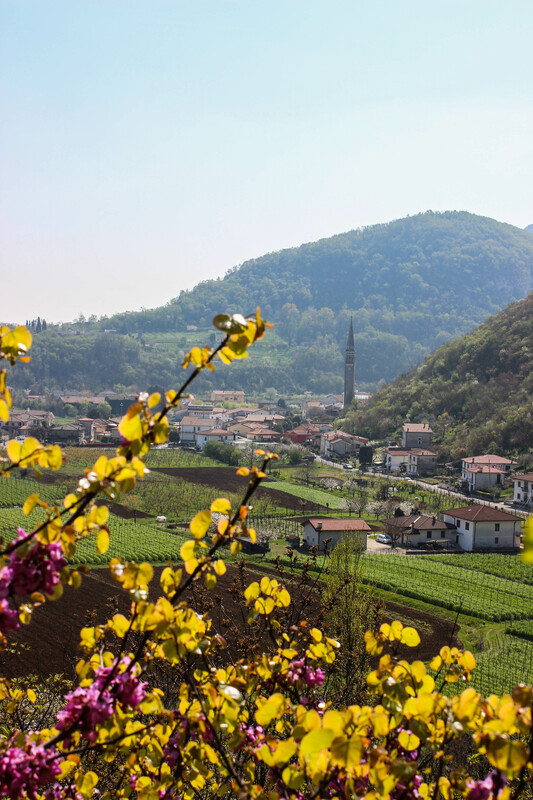 From there, most of the salt is sent to be cleaned and refined, though you will see bags of the unrefined stuff for sale along the road. It’s pretty overwhelming floating through the market. 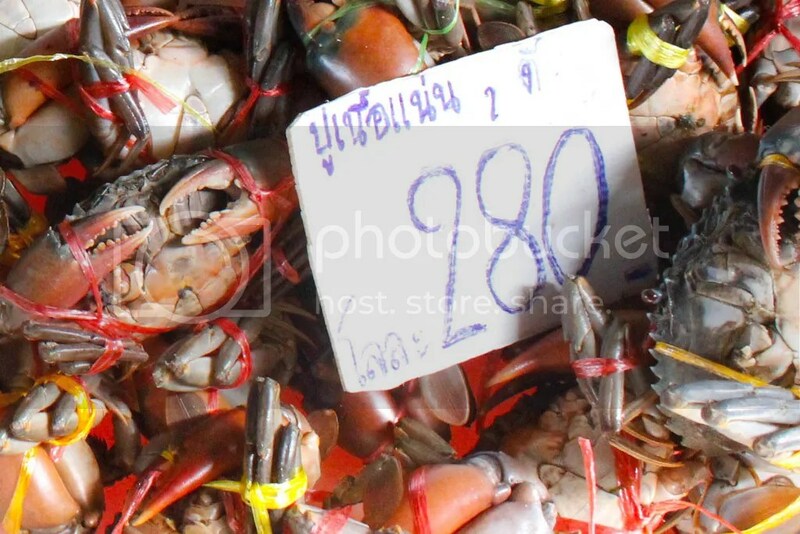 The vendors can be kind of pushy, and you have to know how to haggle, which I don’t. Haggling is important at ALL markets and I absolutely hate doing it, so I tried to make the Husband do it for me as much as possible. 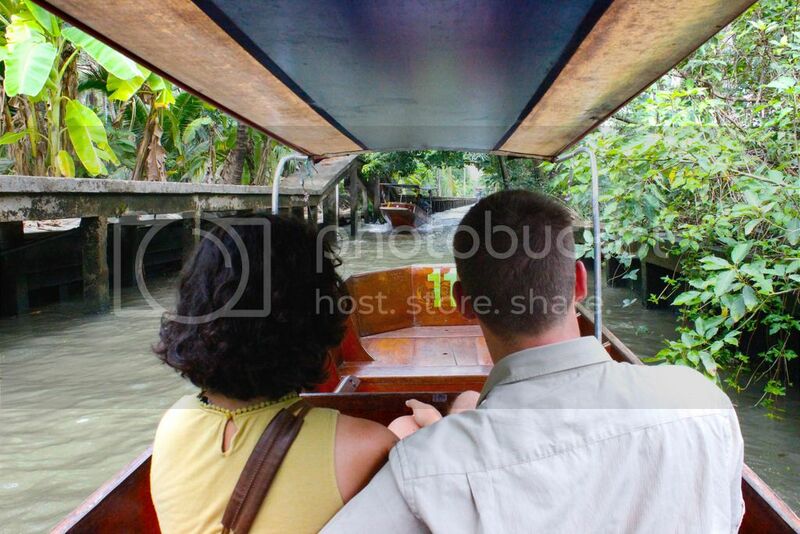 Our guide told us just to raise a hand if we saw anywhere we wanted to stop, otherwise we’d just keep cruising through. I found one large stall full of hand-carved wooden items and hopped off there to buy a beautiful frame – of everything I brought home, this is one of my favorites. I know I overpaid terribly (the Husband was waiting in the boat and of no help), but by American standards it was still a good deal. 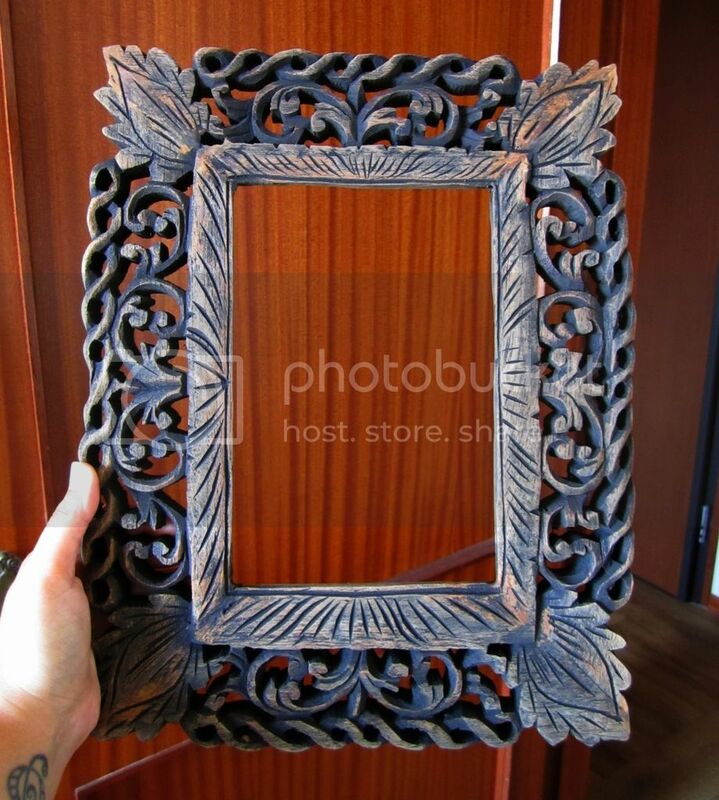 I think I’ll put a mirror in it. Somewhere within the labyrinth of the Floating Market is a palm sugar house. I’m calling it a “house” because in Vermont, a place that makes maple syrup is called a sugar house, and the process for making palm sugar is almost exactly the same. 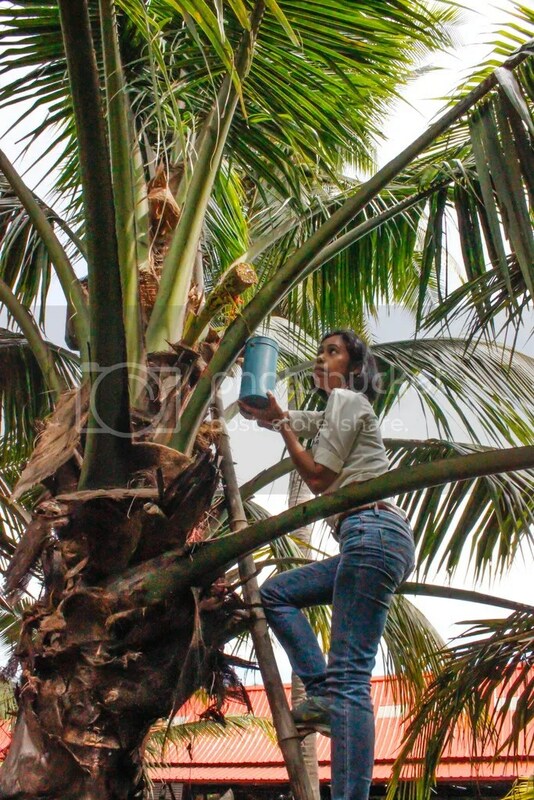 They cut the palm flower bunches and hang a bucket off them, collecting the sweet water and boiling it down until it’s a sticky sugar. Compared to maple syrup it wasn’t that great, but maybe that’s just my inner Spoiled Vermonter talking. 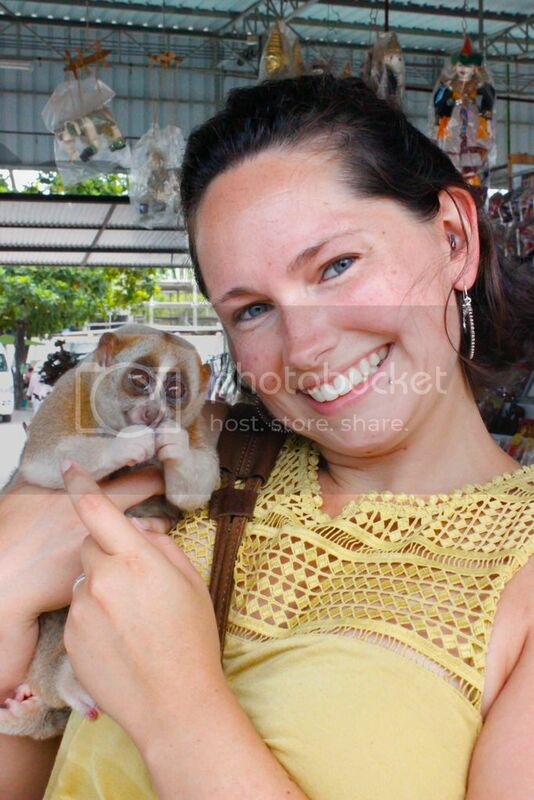 After we hopped out and were leaving through the land-part of the Floating Market, we came across a woman holding a Slow Loris for tourists to take pictures with. I had to do it. It was like a little puff ball with thumbs and eyes. LOOK HOW CUTE, GUYS. 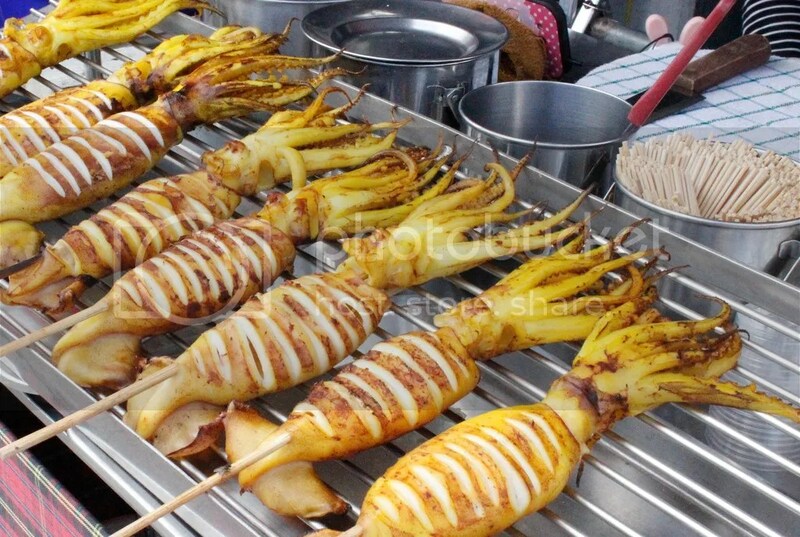 Don’t you want one? No, you don’t, because they’re really not designed for captivity, especially away from southeast Asia since they only eat southeast Asian fruit. 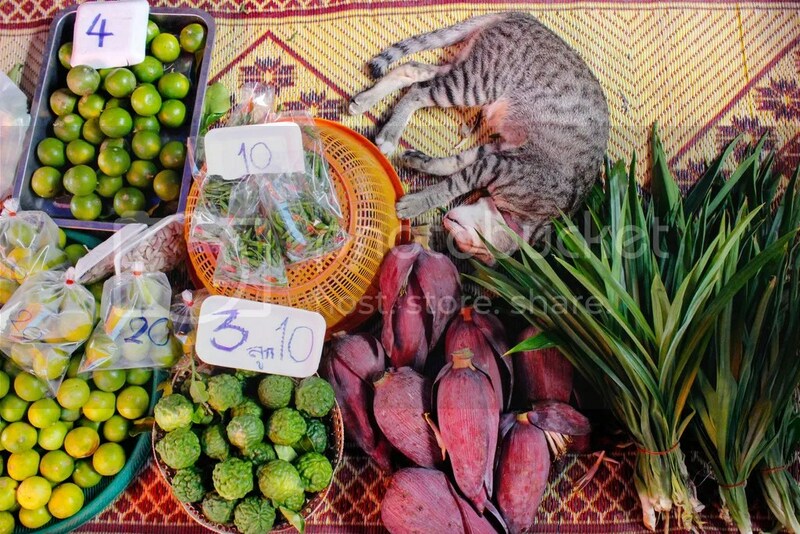 How often do you stock your fridge with rambutans, longans, and jackfruit? Not to mention they have a poisonous bite. 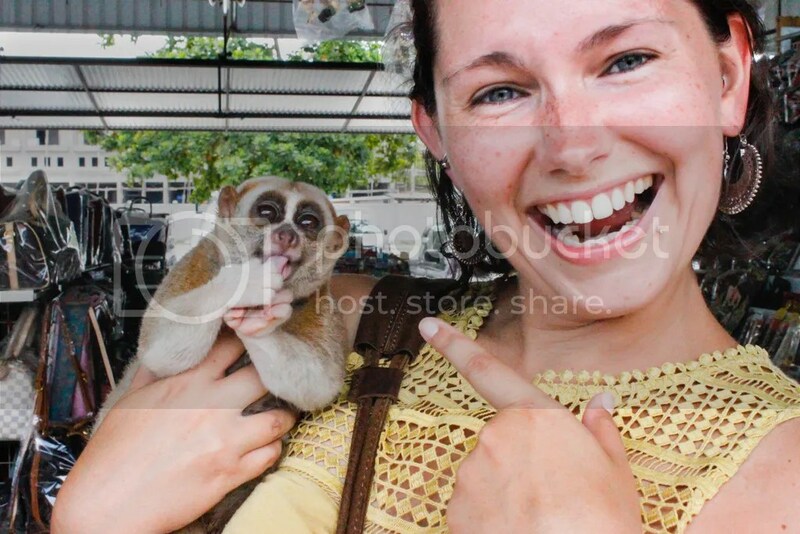 Anyway, I know that posing for pictures is probably not the most wonderful life for a slow loris, and I’m probably a terrible person for taking pictures with it, BUT LOOK HOW CUTE, GUYS. You know how I said the train wasn’t running? 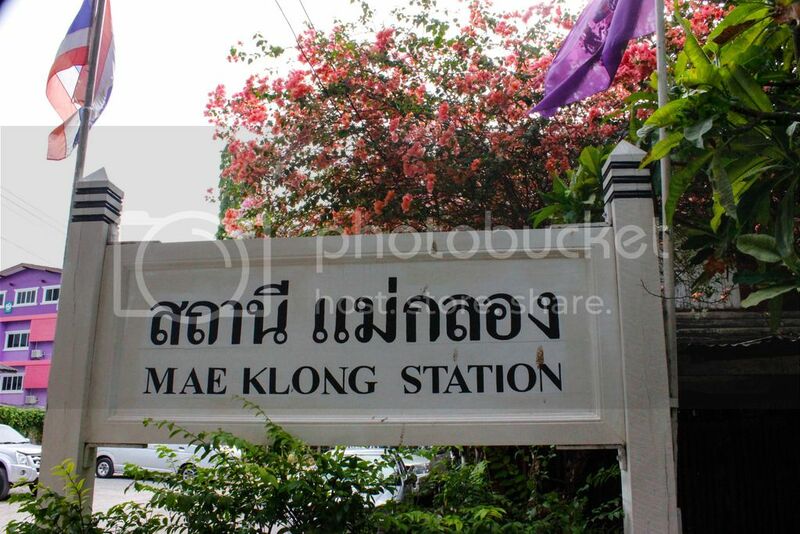 Well unfortunately the out-of-commission train is the same one that rattles through the Mae Klong market. 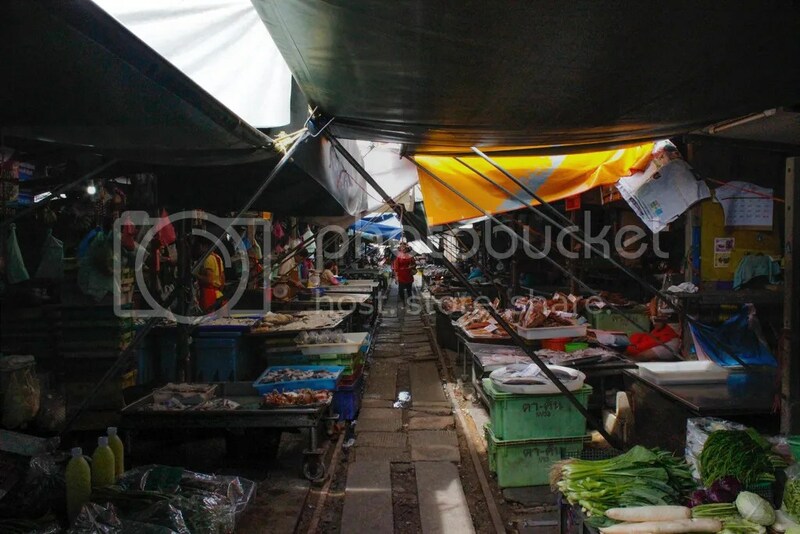 We still went to see the market though, and I’m very glad we did because it was much different than I was expecting. 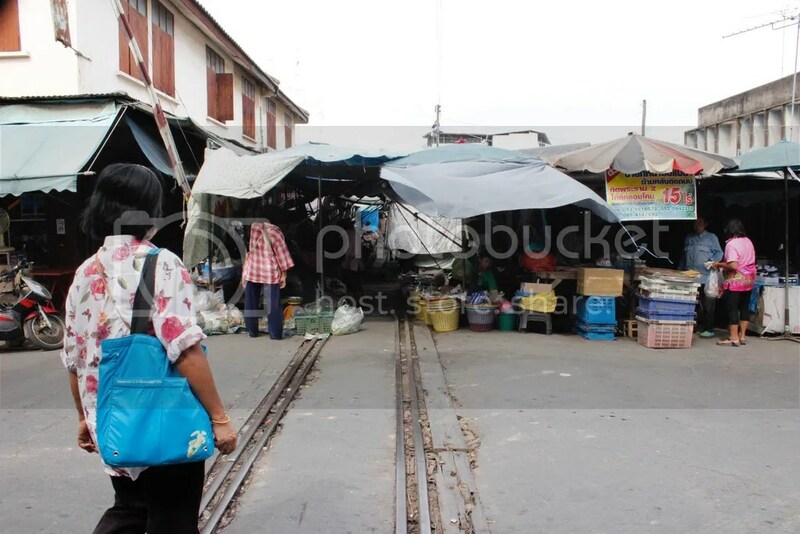 When I thought of a market on the train tracks, I thought of sparse vendors and hesitant awnings half-extended to be pulled back in the blink of an eye. This is not the case. 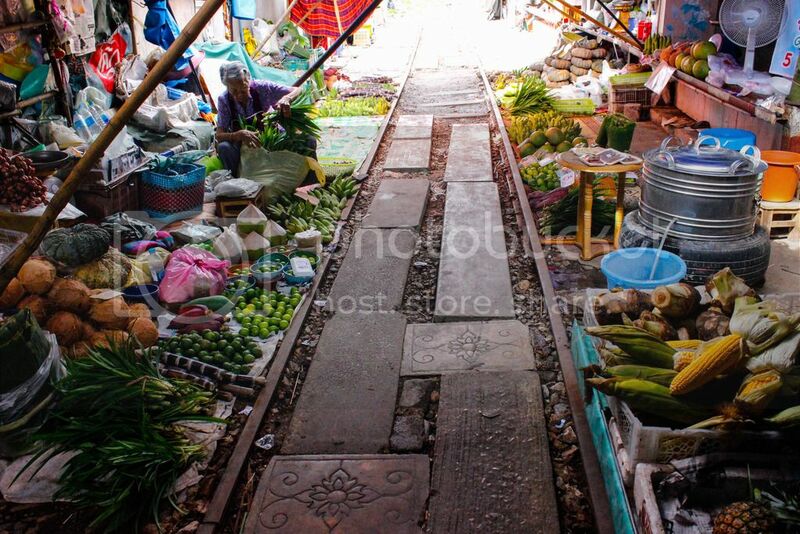 The train track market is dense. It was a sunny day and hardly any light gets past the awnings that cover the narrow alley. Vendors are bumper-to-bumper right to the end, all happily selling their wares inches from the track. Some of them even had TVs and hammocks set up behind to catch a quick nap when things are slow. 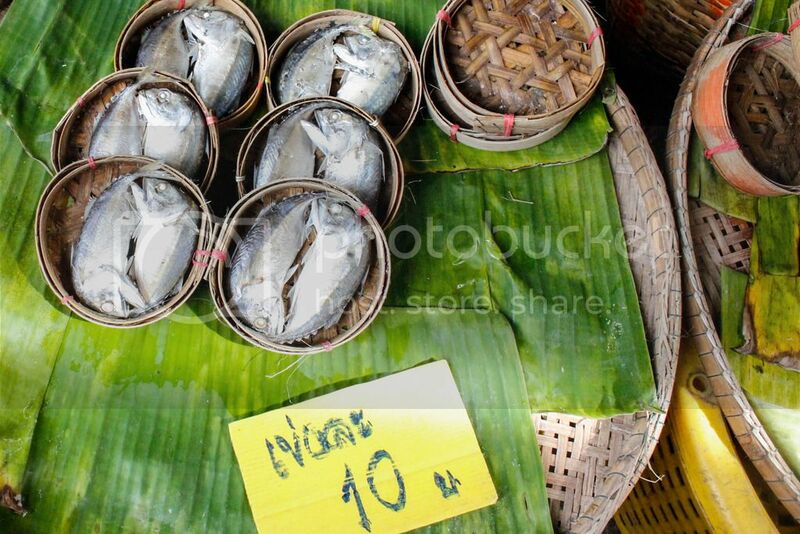 With all the fish being sold, you’d think the place would reek but it doesn’t. 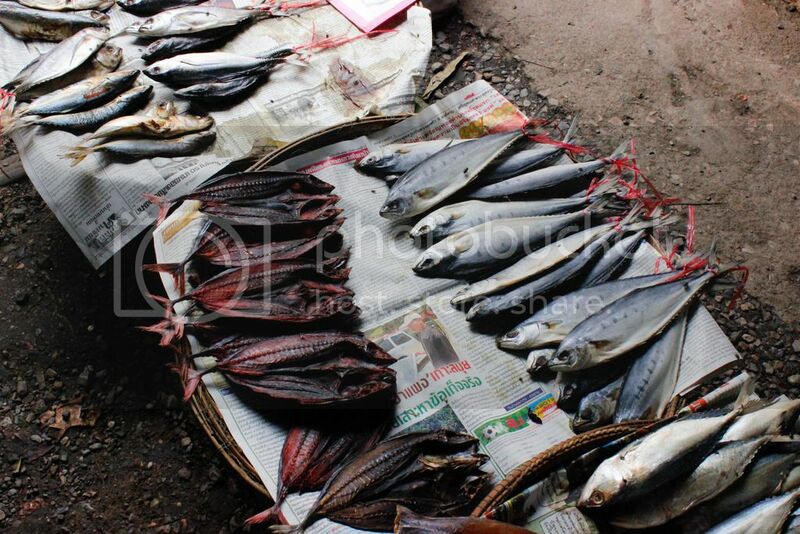 Much of the fish is dried, but even the fresh stuff is inoffensive to the nose. 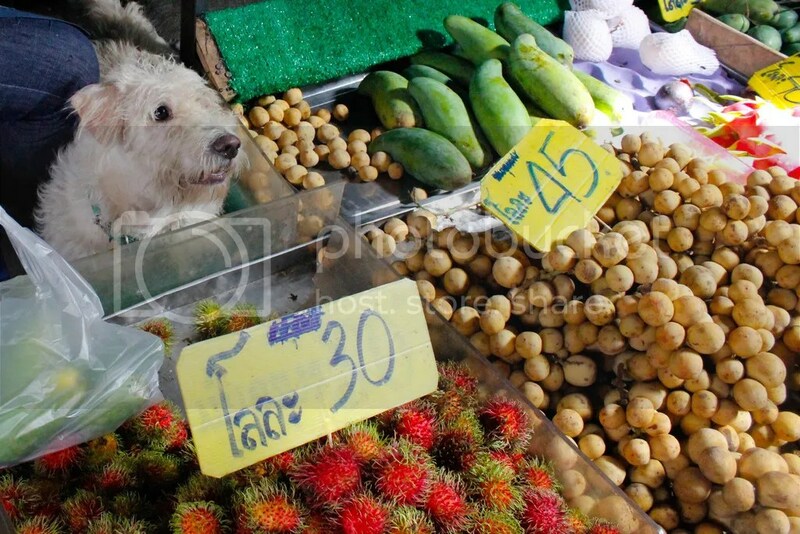 A couple stalls had furry mascots helping guard the fruits and veggies. Check out this awesome lady – she’s tying up live crabs so they can’t scuttle away. We saw baracuda for sale and live eels, and these dangerously pointy-looking fish in steaming baskets ready to be made for lunch. 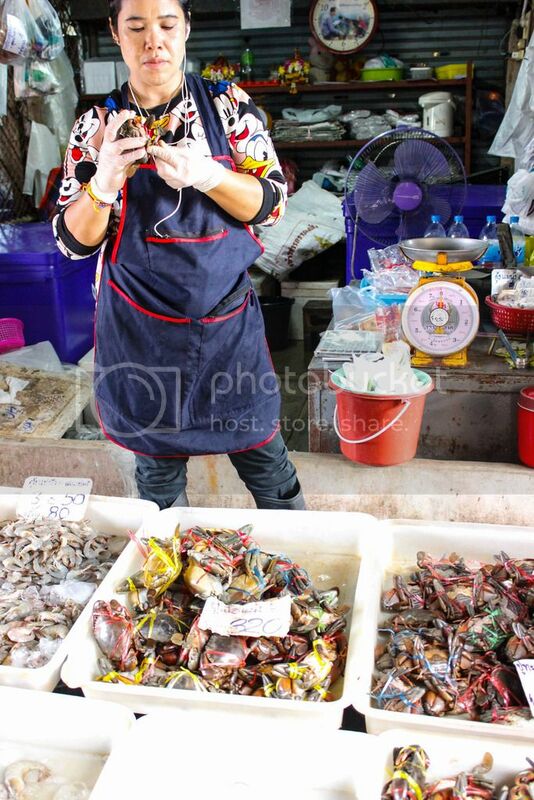 We saw fresh shrimp and tiny dried shrimp (white and orange varieties to match your outfit). And a huge amount of “mystery produce.” Is it a fruit or a veggie? How do you eat it? We’ll probably never know. 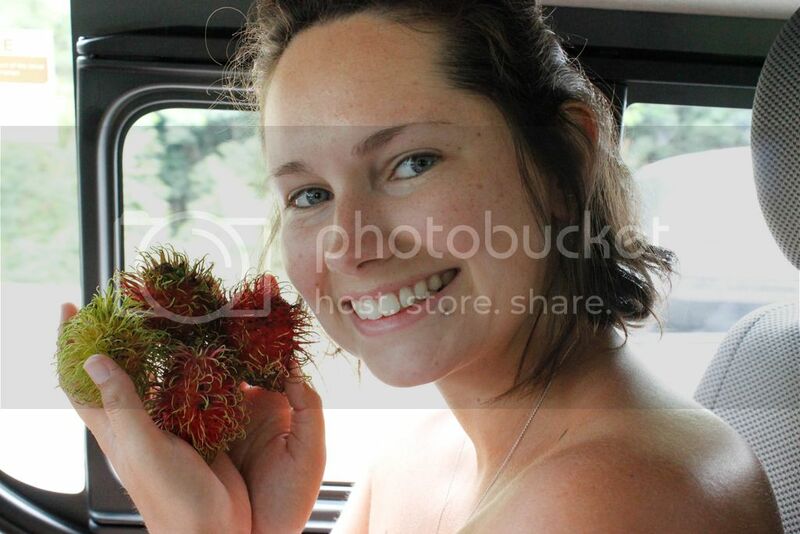 Our guide picked out some fruits and then ambushed us when we were back in the van – “These are for you.” And so we got to try rambutans and longans. 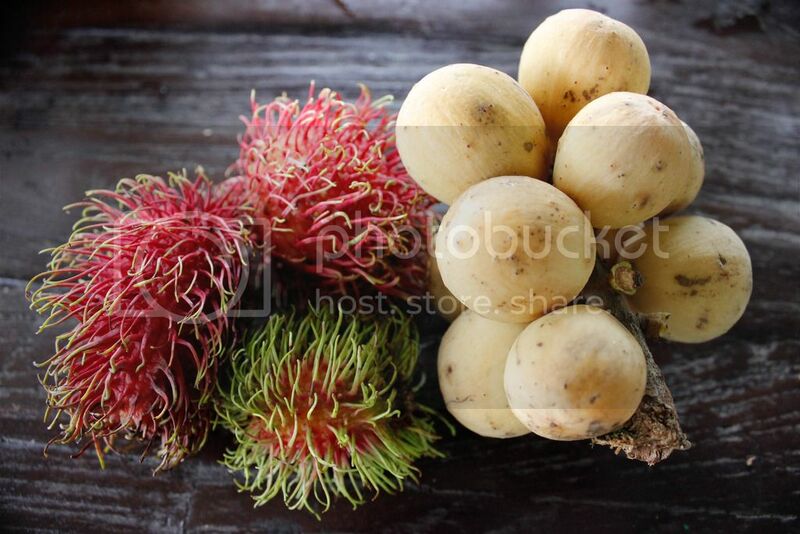 The rambutans are the ones that look like they probably came from another planet, while the yellow longans look safe enough. Both need to be peeled and reveal white fruit inside. 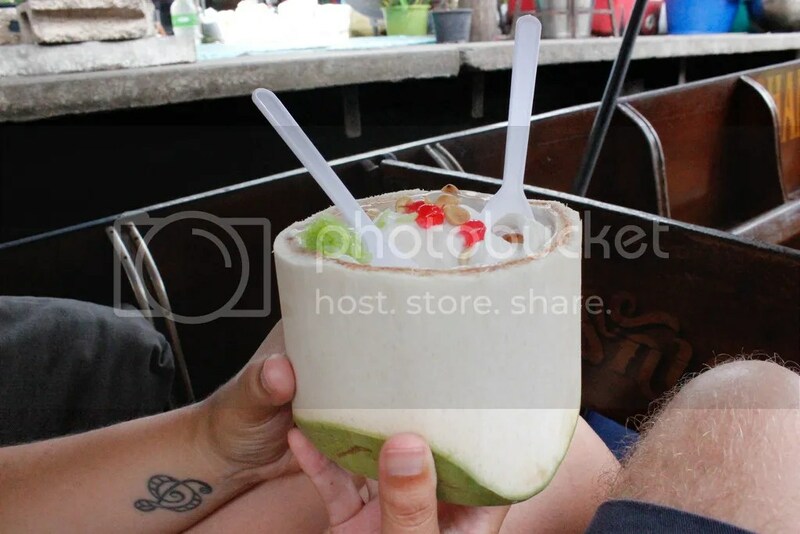 Bite into the rambutan gently because it has a big, almond-shaped pit. 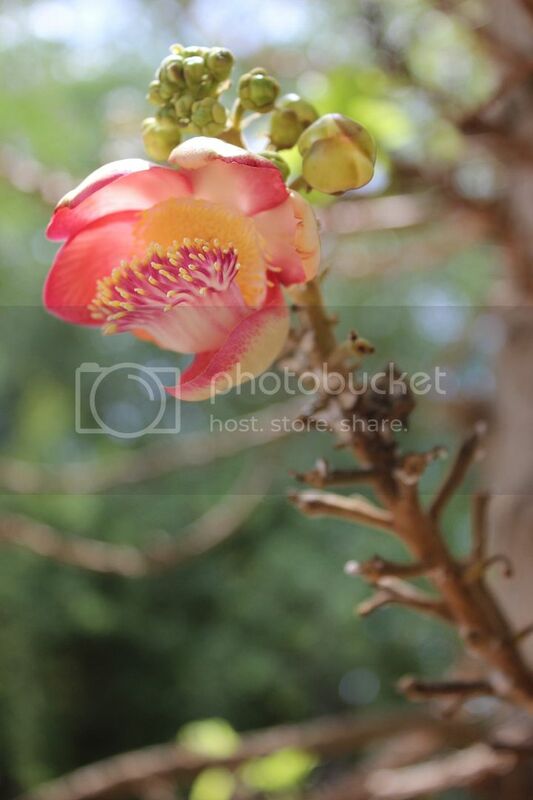 The longan fruit is very soft and sectioned a bit like an orange – the longans were my favorite, except that peeling too many will leave a sticky pine pitch-like gunk on your fingers. 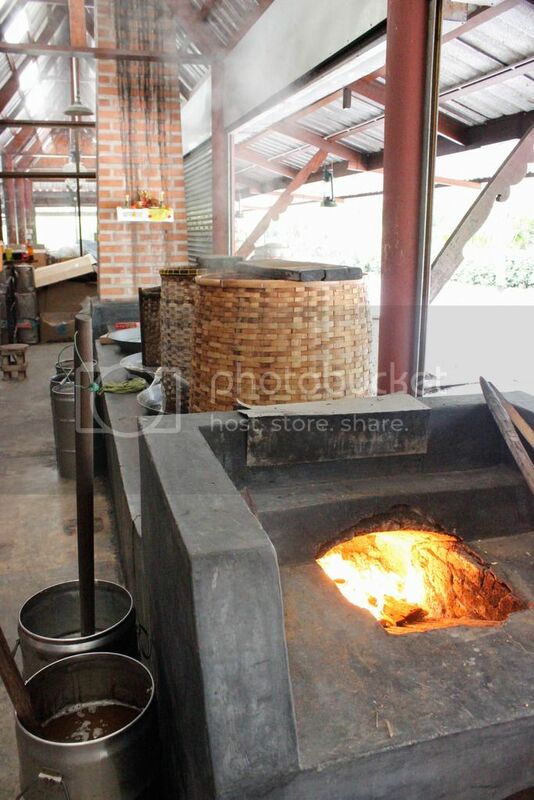 We were very lucky to be brought to the small, family-owned factory called Pinsuwan Benjarong. 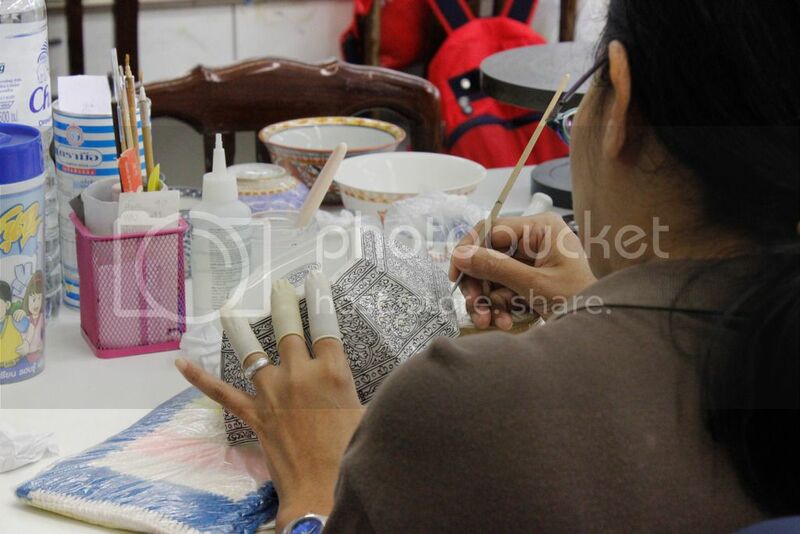 “Benjarong” apparently means “5 colors” and is a very old style of Thai ceramics dating many back hundreds of years. 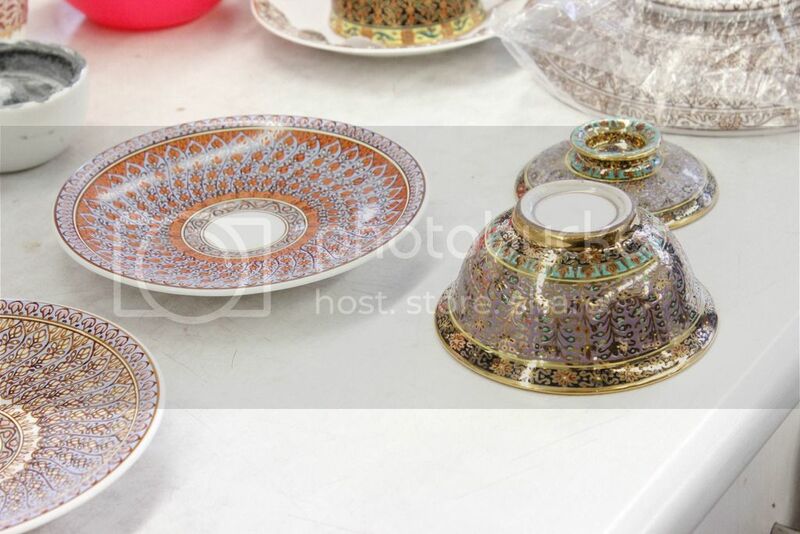 Though they now use up to 8 colors on many pieces, each one is still entirely handpainted. 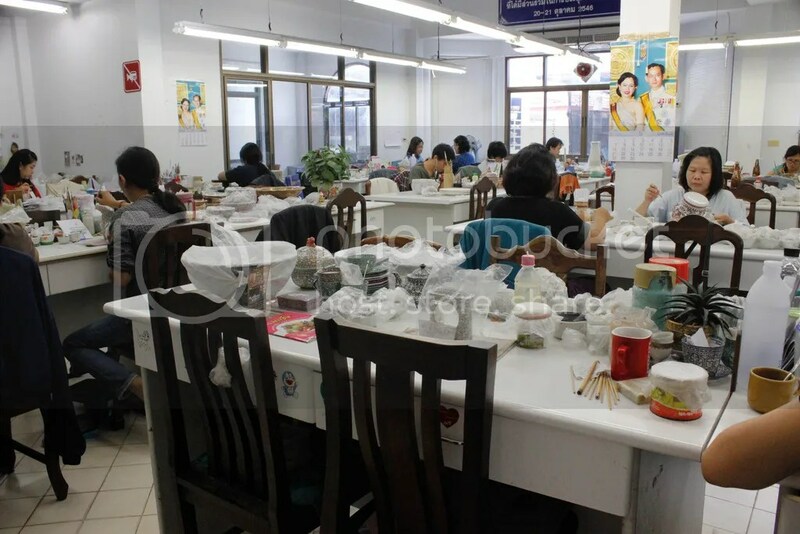 The small workroom had about 15 painters working – many had headphones in to help their concentration. They don’t mind you taking pictures if you don’t distract them, so try to be quiet and definitely don’t use flash. 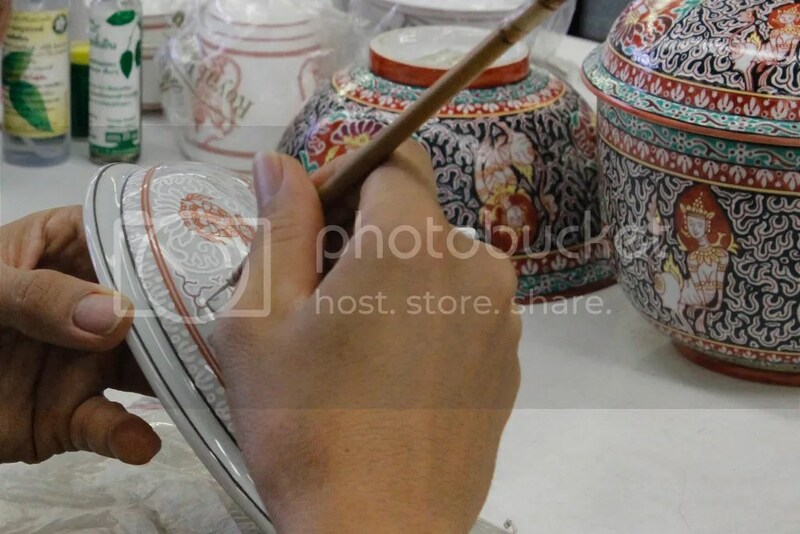 They mixed their glazes every few minutes while they worked, perhaps to keep them from separating or hardening. 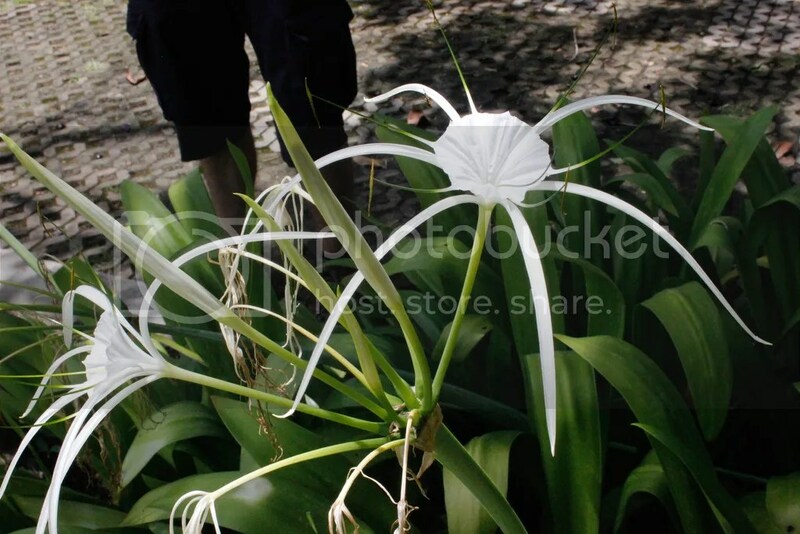 I was astounded to see that most of their work is free-hand – the designs are not sketched on before and there are no measurement marks for scale. Some of the more complex, asymmetrical designs did have a graph laid on first, but we only saw one like this in the entire room. From the work room you walk into their tiny store room. Most, but not all, of what you see is for sale. 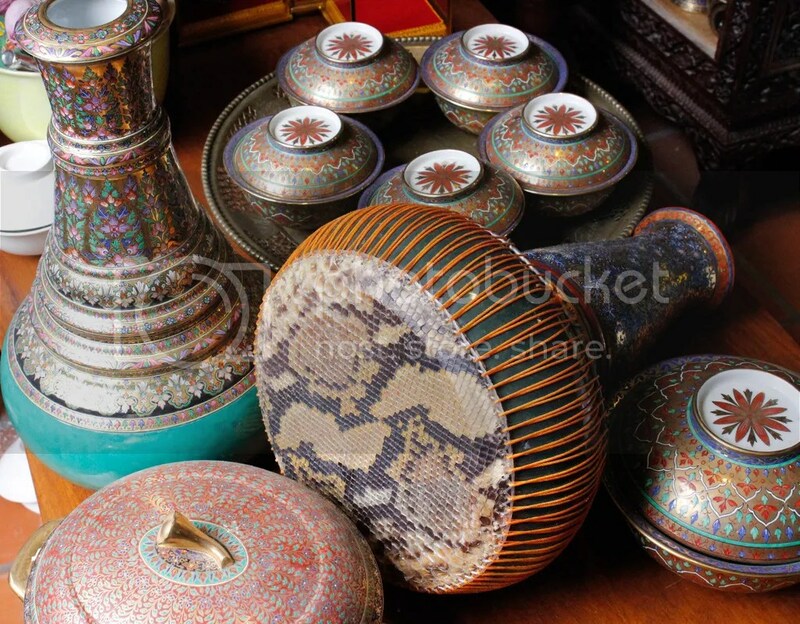 From minuscule chopstick rests to dazzling tea sets and traditional drums, each piece is breathtaking. These pieces are understandably expensive, but the Husband said I had to pick one. I wanted it to be something I wasn’t way too afraid to use…. 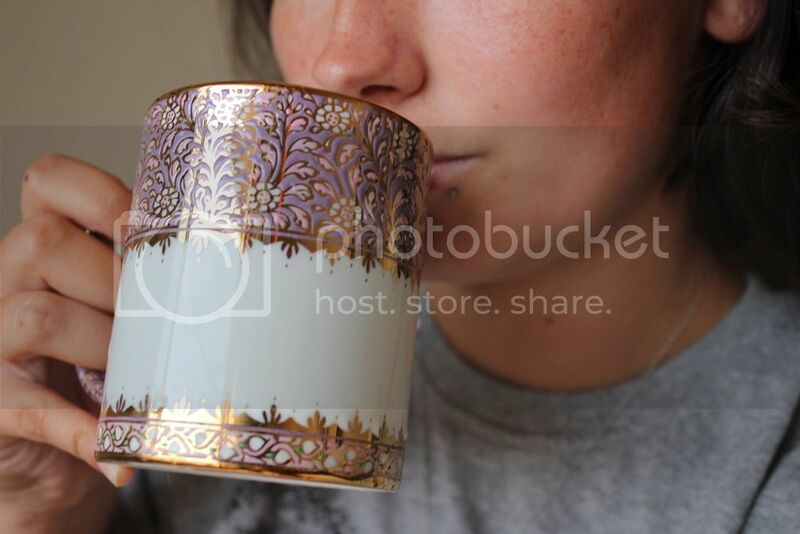 So meet my new favorite coffee mug. Please, Lord, don’t let me drop it. 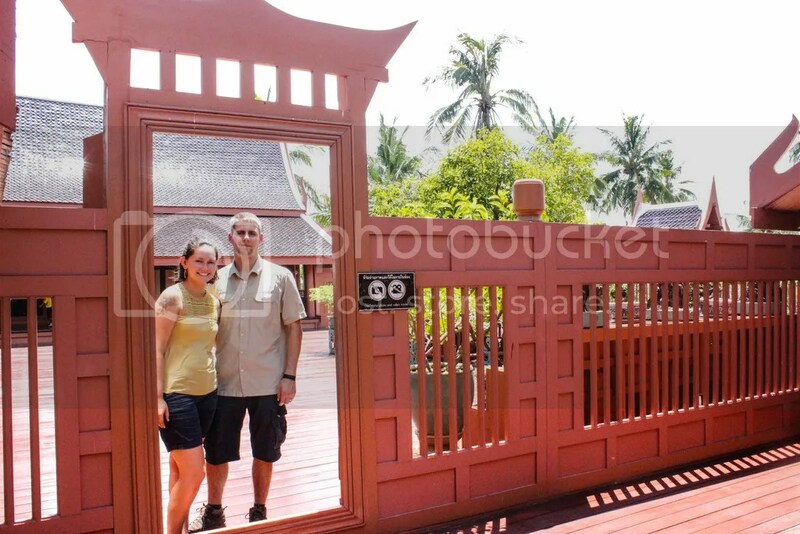 We also made a brief stop at the King Rama II Memorial Park and Museum. I won’t lie, I could have done without this part of our day. It’s a pretty place to wander around though, and the museum is interesting because you can see how the royal house was set up (different houses for men and women) and the roles they adhered to in those days. King Rama II ruled from 1809 to 1824 and seems to still be quite beloved in the hearts of Thai people today. He was a huge advocate for the arts, so maybe that’s one reason. Before leaving the Amphawa district (pronounced without the H, by the way), we stopped at Wat Bang Kung. (Remember before how I told you what “wat” means?) 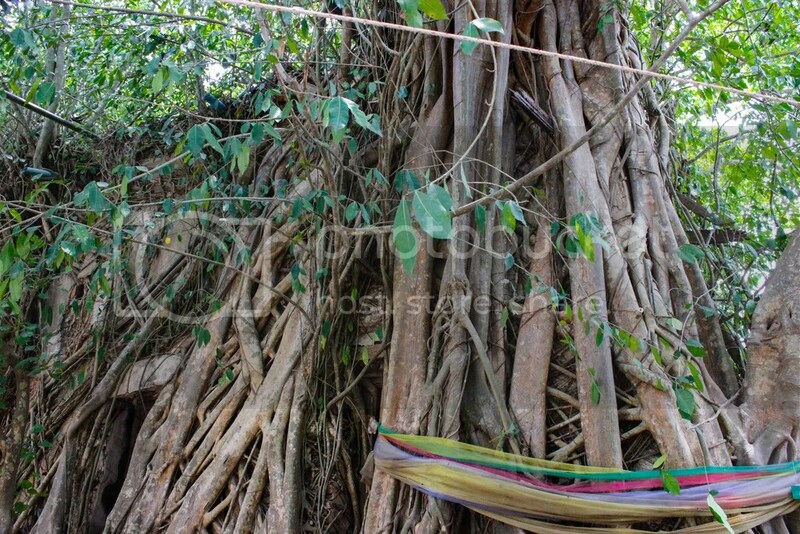 This temple is one of the more unique ones in Thailand because the tiny building is completely enveloped by the roots of a banyan tree. Our guide told us that they didn’t even know it was there until someone tried to get rid of the tree, and that it dates back about 400 years. I don’t know how true any of that is, but I’m gonna go with it. 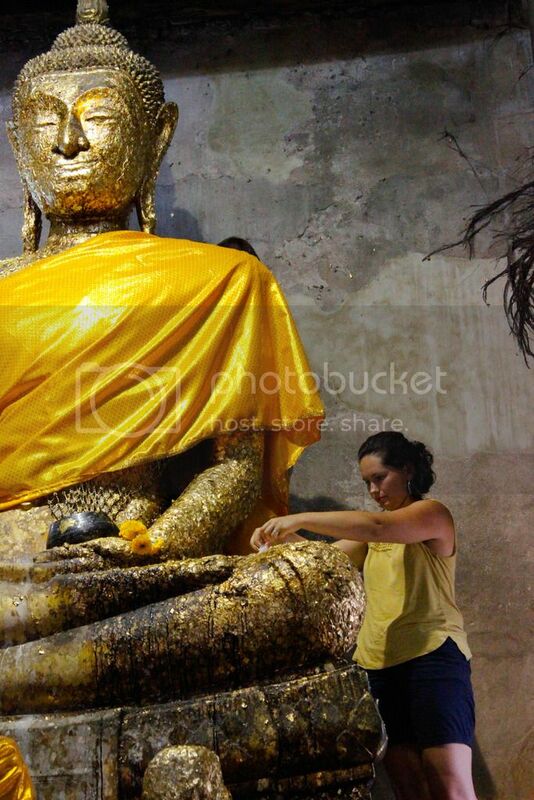 Here at Wat Bang Kung we were invited to take part in the Buddhist ritual of making an offering to the Buddha image. I’m not sure how much they cost, but the Husband and I both got an offering pack. This included ฿20, a few tiny tissue papers, an incense stick, a string of flowers, and an offering stick with a gold heart-shaped end. 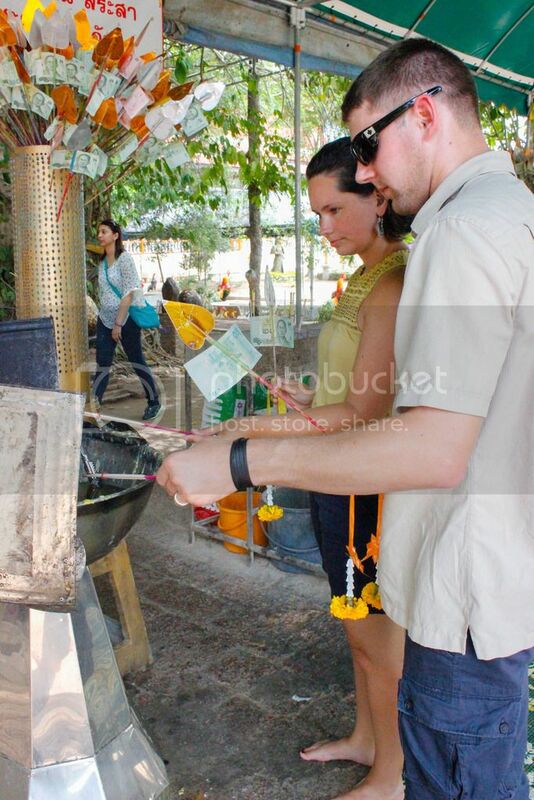 The offering stick had a slit at the top, where you would put your ฿20 note. To begin, you must remove your shoes. 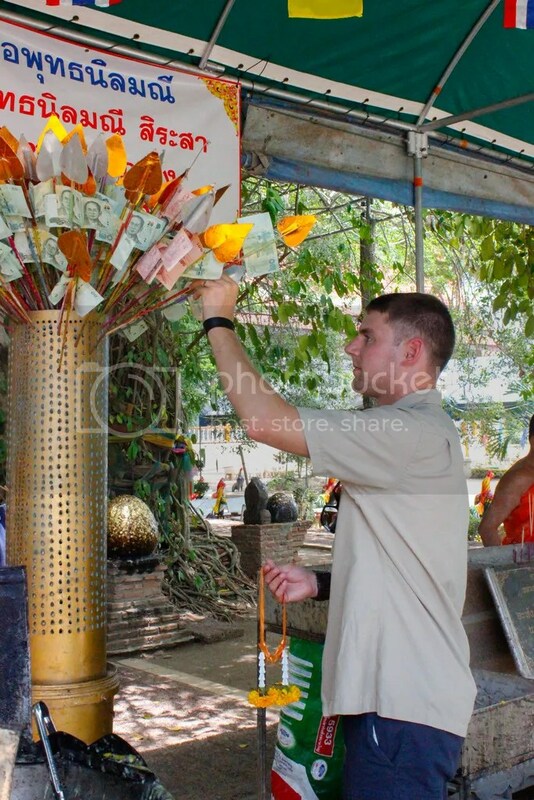 Then you kneel in front of the offering area just outside the tiny temple, and “make a wish.” In Buddhism I assume this is prayer, though I don’t entirely understand how making wishes helps you be free of desire…. Maybe you can wish specifically for that? 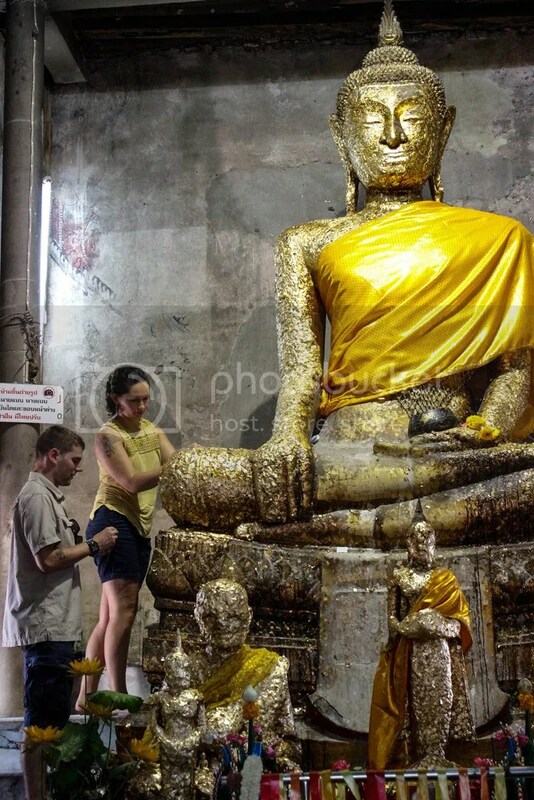 Here it should be said that when sitting or kneeling in front of the Buddha (or anywhere, actually), it is extremely disrespectful to point your feet forward. The feet are dirty and to point them toward friends or family is not acceptable, so you will always see Buddhist people kneeling or tucking their feet to the side. Our guide said that sitting cross-legged is also ok, though I didn’t see many people doing that. While the feet are dirty, the head is considered sacred in Buddhism – don’t ever touch anyone on the head, and never step on a pillow. Now, back to the offering. After making your wish, you light your incense and stick them in the sand with the others, and take your offering stick and put into this tall, gold holder thingy. From there you go inside and hang your flowers in front of the Buddha. So what are these weird tissue papers for? Well you’ll finally notice that they’re folded in half, each holding a tiny square of gold leaf. 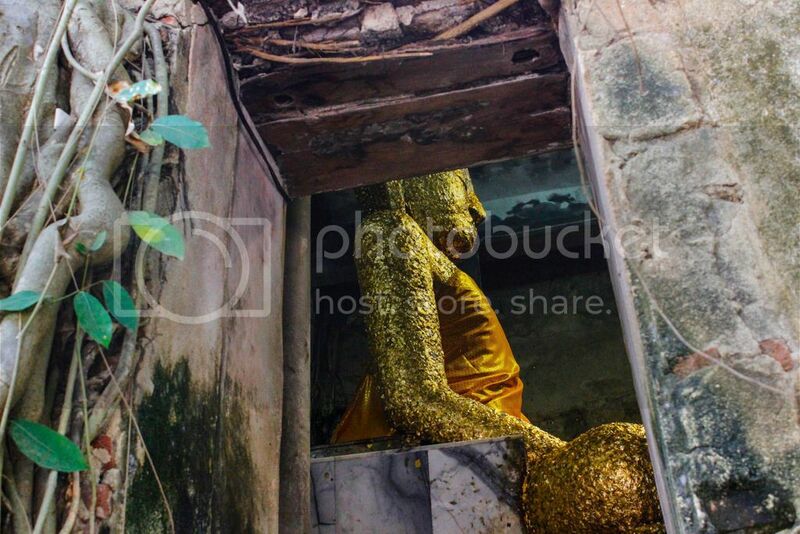 The gold leaf is for the Buddha – there’s a narrow platform all the way around him where you can walk and carefully stick the gold onto a part of his body. Any part you want. Each part is supposed to bring a different type of luck, but you’ll have to look that up for yourself because I don’t remember them. 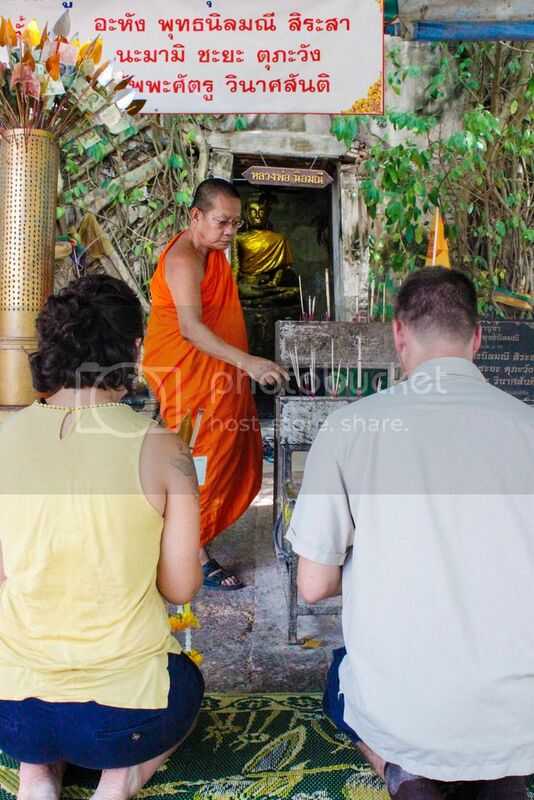 Our guide was very polite and checked to make sure we were comfortable doing a Buddhist ritual. Being a Christian myself, I took part in the ritual for the experience of it and not to actually worship the Buddha (sorry, Buddha), but I’m glad I did. Then it was back to Bangkok for our last night in the city, where I got a real Thai massage at the spa next door. I have no pictures to show, but it was an hour long and damn, did that tiny Thai woman put the hurt on me. Seriously, it is painful. It’s much more therapy than it is relaxation. So if you’re looking to relax, do yourself a favor and get an aromatherapy massage or something. Unfortunately I didn’t learn until later that after a Thai massage, there’s a prescription that goes along with it. Take paracetamol and no showers till the next day. Seriously. They actually tell you take a pain killer and let your muscles recuperate without heat. Perhaps my masseuse would have told me if she’d spoken English…. So now you’re officially more prepared than I was. Good luck! 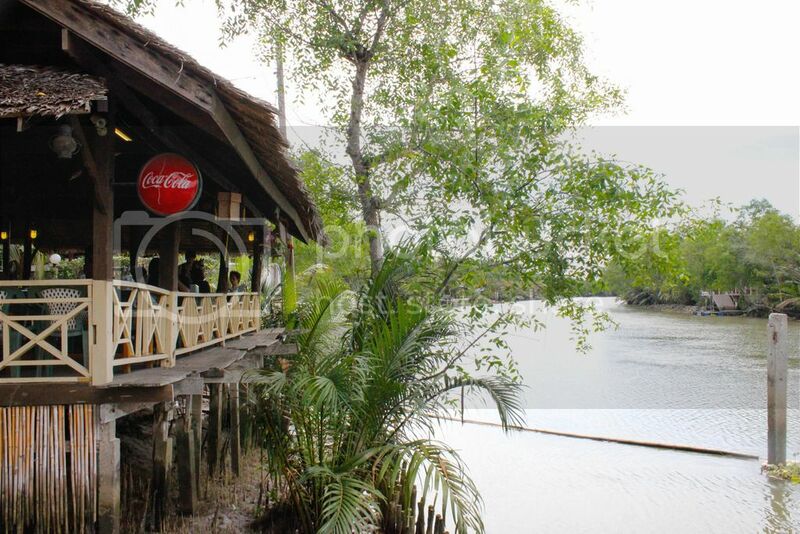 Tomorrow we leave the big city for Elephant Hills in the Khao Sok rainforest! Find the entry here. 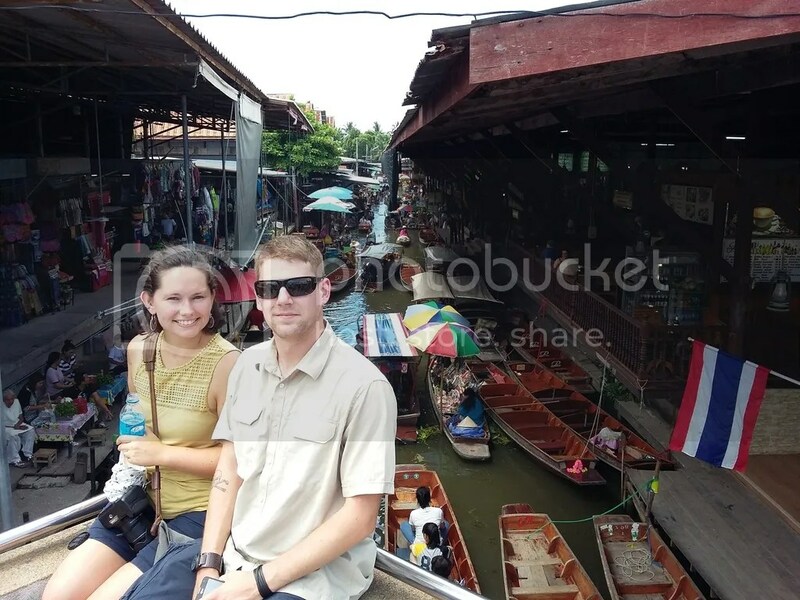 This entry was posted in Asiadventure, Travels and tagged Amphawa, Asia, Benjarong, Buddha, Floating Market, King Rama ii, longan, Mae Klong, market, palm sugar, porcelain, rambutan, salt farm, slow loris, Thai massage, Thailand, Train Track Market, travel, Wat Bang Kung. Bookmark the permalink. 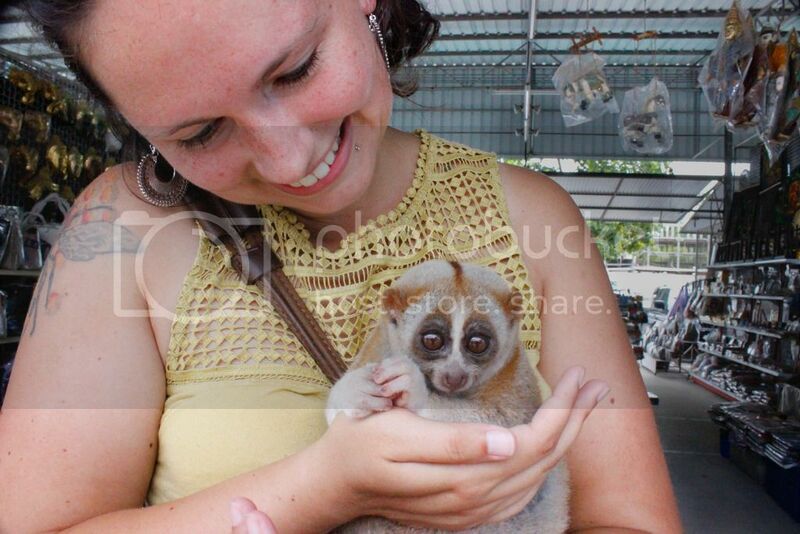 That creature is soooo cute totally worth holding. Love the frame.